In my 9 to 5 job, I manage energy. There are literally 80+ meters providing systems information at the click of a mouse, and I am always looking for ways to save based on what those meters tell me. Sadly, I have not been able to do this same thing with my home because I dont have the equivalent metering system for my home. Functional, not flashy. No analysis beyond the hard data, which is what you would expect from your utility – whose job is to get you the energy, and bill you for it. They let you decide what to do with the information. Note that our energy consumption went up significantly just before I got home, when we turned the A/C on and used the stove for dinner. The same data is conveyed, but now we have something to compare to (our average), and something to target (reductions! ), as well as progress based on the time period chosen. A really neat feature of Lowfoot’s application is that it will calculate your baseline, and literally pay you for energy savings. My baseline can be seen as the red line above, and my actual consumption compared to the target (30% savings for yesterday). I haven’t seen yet what the monetary amount that generated (pun intended) Lowfoot credits will become, but love their line of thought in providing a monetary carrot to users to save energy. It will definitely help to grow their user base. There are ads on some of the pages, but they are not intrusive. Quinzee is another site, developed in Toronto, that came to my attention recently. 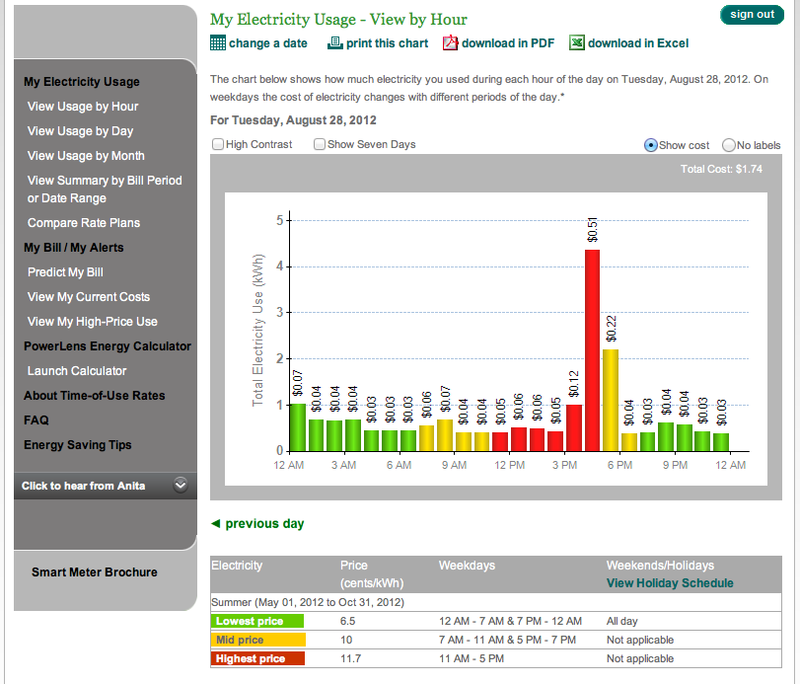 Launched at the beginning of August, Quinzee accesses your smart meter data and presents it similarly to Lowfoot, including the baseline average. 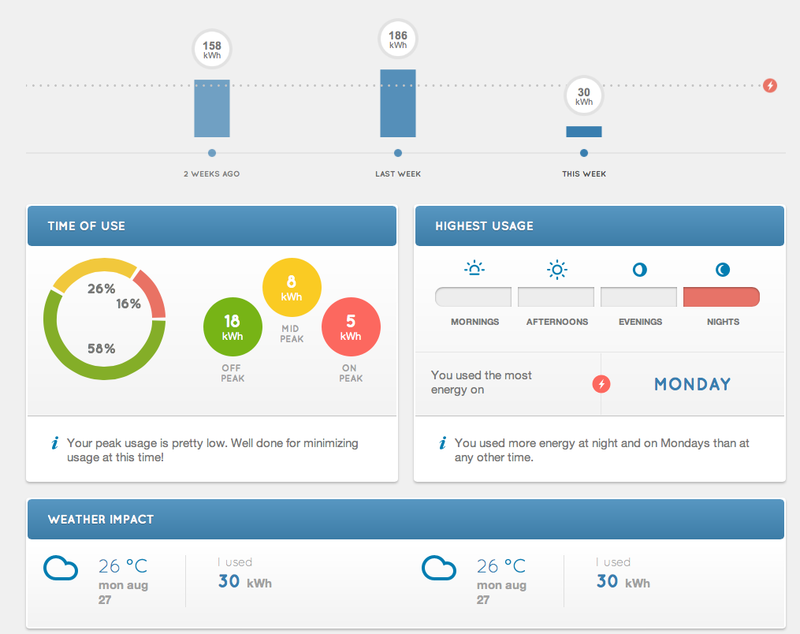 Its graphics are more iPhone/iOS like, and convey more analytics than the Lowfoot dashboard. It allows to you enter specifics about your home, so that you can compare to other users near you, or like you. A nice touch, that should facilitate some competition between the Hatfields and McCoys. Wouldn’t comparing utility bills be better than comparing lawns? My biggest gripe is that only weekly and monthly summaries are available. Like much of my generation, I want instant gratification, and want to see what yesterday’s efforts yielded me. I’d love to see live consumption details, but realize that this is not how Toronto Hydro records/shares the information (I’ll cover this in an upcoming post). A tweet to Quinzee led me to believe they are working on adding daily data functionality. Both sites have blog sections, with Quinzee taking a more story telling, humour-filled approach that is definitely entertaining, but doesn’t allow users to blog within the site. Lowfoot encourages users to provide product reviews, status updates, and allows users to link to social media sites (I linked my account to Twitter and created @houseenergymgmt as a handle to tweet out my updates and consumption numbers). It is a forum with a user base engaged to share lessons and project ideas. Both sites also contain conservation strategies, tips, and suggestions for what to target in a way that is easy to understand and actionable. Which site you prefer depends on how engaged you like to be. I like features of both sites, and am actively using both to try to bring our home’s energy consumption as low as possible, and to share what I have learned with others to help them do the same. I will share more as I get used to the sites and have a bit more screen time with them, and see how they evolve. These type of apps are what I have been waiting for since I started to learn about the smart grid. 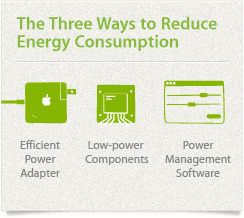 Hopefully more users will use these tools, saving themselves energy and money. Smart meters really do open up opportunities, and these apps are proof of that. Did I mention both services are free? Gadgets are a growing and ever more integrated piece of our daily lives. At home, I have a laptop in use all day, by either my wife or myself. Then, we have an iPad that needs charging every couple of days. My wife and I each have a cell phone, and our entertainment centre has a cable modem, game console, HD PVR, wifi hub, network connected hard drive, and a my thermostat gateway. Add to that cameras and the never ending stream of kids toys that need batteries. Where to start to reduce these growing energy loads? By a laptop instead of a desktop. It will use 50+% less power than a desktop. Look for EPEAT (a rating for how green an electronic device is) and compare. Responsibly recycle your old computer (if getting rid of an old clunker). Many cities have programs to keep these hazardous material containing devices out of landfills). Use all the power saving settings to have the battery last longer. For example, I am metering this Macbook while it’s charging at only 35 watts. Compare that to my old (not Energy Star certified) laptop at 100 watts. The battery lasts longer, and I sacrifice nothing in performance. Ask your IT department at work if they follow these guidelines for purchasing as well. 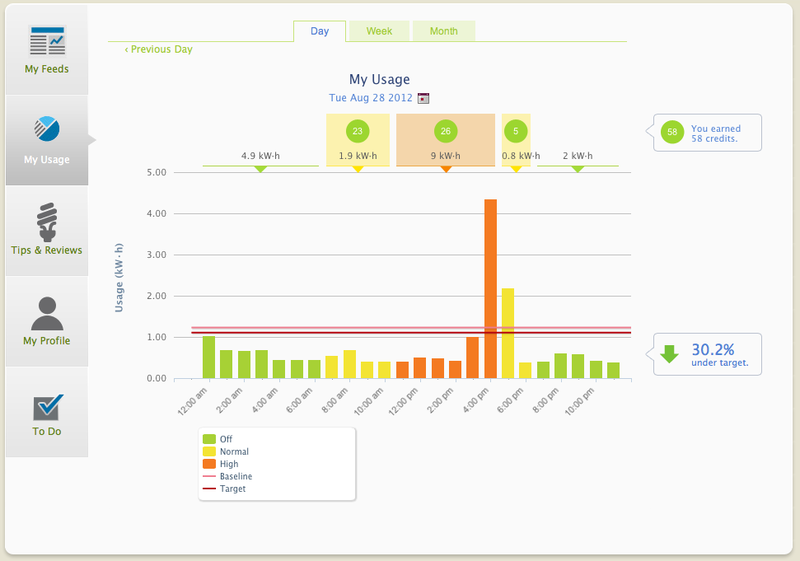 Your energy manager, accountant, or whoever is paying the electric bill will notice a difference! Some other great ideas for the back to school list here, including some specific suggestions as to which laptop might be the greenest.